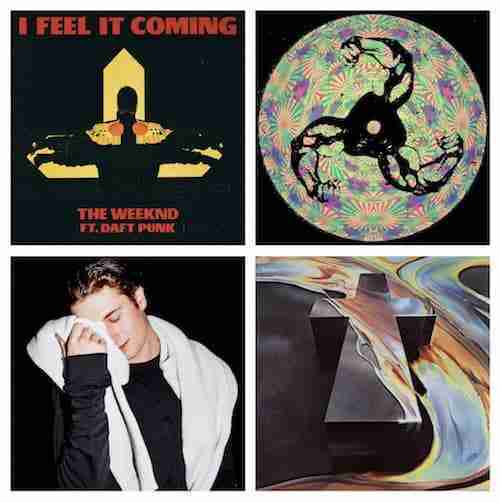 New Music this week coming from none other than Daft Punk with – I Feel It coming, their second collaboration with the Weeknd. Justice are back with their third LP – Woman, but is it all skirt and no trousers. Bicep are keeping up the pressure for end of year honours with the 9th EP on their Feel My Bicep imprint: Brassica – Time Tunnel EP. Australia’s Mall Grab is in surprisingly relaxed surroundings with his remix of Kilo – Walls To Build. Starting with Daft Punk and their I Feel It Coming collaboration, two things strike you immediately. Firstly, unlike their first Starboy collaboration, you can unmistakably hear the Daft Punk influence on this record. Random Access Memory style funk bass, staccato disco synths, looping house style vocals and trademark vocoders are all present. Secondly, and perhaps most striking, is the obvious Michael Jackson influence. Overall its a strong pop song that fans of Get Lucky will rightly adore, however we can’t help but feel, particularly in light of the new Justice record, that Thomas and Guy need to take Nile Rodgers off speed dial and replace him with Skrillex, or someone as equally high octane. It’s all getting a bit too afternoon tea and scones! Next up Justice and their third album – Woman. Justice like Daft Punk made their names making high energy, in yer face beats. Anthems such as Genesis, Civilisation, Waters Of Nazareth really got the blood pumping, but like their parisian forebears it would appear the silk pyjamas are on and the log fire is lit. Whilst Woman is an accomplished sounding record it lacks panache or any sense of dynamism. One can’t help but feel that since their 2007 debut – Cross, that chasing skirt has become an increasingly unhealthy distraction in their relationship with music. Bicep finished 2015 crashing into the most coveted of Top 20’s – reaching 17th in RA’s annual Top 100 DJ poll. Since then their ascendancy to the top has been unrelenting with a slew of releases, peaking with what could be the remix of the year – Issac Tichauer’s – Higher Level (Bicep Remix). A brand spanking new AV show. And a tour schedule to rival a Presidential campaign. All of which suggests that this year a Top 10 RA finish must be on the cards, and who’s to bet against them… Brassica – Time Tunnel is more trademark 90’s analog driven House. Fourth on this weeks round up is Australia’s Mall Grab, a producer and DJ predominately know for his jacking House party anthems. Yet on this occasion it would appear, like Daft Punk and Justice before him, that a glass of red and a log fire have taken centre stage on his remix of: Kilo – Walls To Build. Lounge type keys, luxuriously smooth bass and a soulful vocal firmly place this effort in the Deep not Jacking House domain.